"Mengele" redirects here. For other uses, see Mengele (disambiguation). 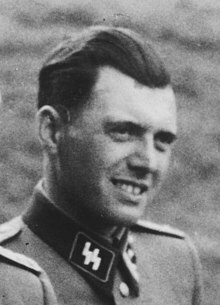 Josef Mengele ([ˈjoːzɛf ˈmɛŋələ] ( listen); 16 March 1911 – 7 February 1979) was a German Schutzstaffel (SS) officer and physician in Auschwitz concentration camp during World War II. He performed deadly human experiments on prisoners and was a member of the team of doctors who selected victims to be killed in the gas chambers. Arrivals that were judged able to work were admitted into the camp, while those deemed unsuitable for labor were sent to the gas chambers to be killed. With Red Army troops sweeping through Poland, Mengele was transferred 280 kilometers (170 mi) from Auschwitz to the Gross-Rosen concentration camp on 17 January 1945, just ten days before the arrival of the Soviet forces at Auschwitz. After the war, he fled to South America where he evaded capture for the rest of his life. On 28 July 1939, Mengele married Irene Schönbein, whom he had met while working as a medical resident in Leipzig. Their only son, Rolf, was born in 1944. Jewish twins kept alive in Auschwitz for use in Mengele's medical experiments. 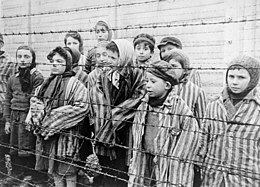 The Red Army liberated these children in January 1945. Despite having provided Mengele with legal documents using his real name in 1956 (which had enabled him to formalize his permanent residency in Argentina), West Germany was now offering a reward for his capture. Continuing newspaper coverage of Mengele's wartime activities, with accompanying photographs, led him to relocate once again in 1960. Former pilot Hans-Ulrich Rudel put him in touch with the Nazi supporter Wolfgang Gerhard, who helped Mengele to cross the border into Brazil. He stayed with Gerhard on his farm near São Paulo until more permanent accommodation could be found, with Hungarian expatriates Géza and Gitta Stammer. With the help of an investment from Mengele, the couple bought a farm in Nova Europa, which Mengele was given the job of managing for them. The three bought a coffee and cattle farm in Serra Negra in 1962, with Mengele owning a half interest. Gerhard had initially told the Stammers that Mengele's name was "Peter Hochbichler", but they discovered his true identity in 1963. 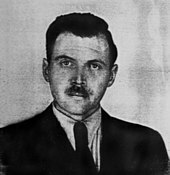 Gerhard persuaded the couple not to report Mengele's location to the authorities, by convincing them that they themselves could be implicated for harboring the fugitive. In February 1961, West Germany widened its extradition request to include Brazil, having been tipped off to the possibility that Mengele had relocated there. Other aliases used by Mengele in his later life included "Dr. Fausto Rindón" and "S. Josi Alvers Aspiazu". In 2007, the United States Holocaust Memorial Museum received as a donation the Höcker Album, an album of photographs of Auschwitz staff taken by Karl-Friedrich Höcker. Eight of the photographs include Mengele. Hereditary Transmission of Fistulae Auris. This journal article, published in Der Erbarzt (The Genetic Physician), focuses on fistula auris (an abnormal fissure on the external ear) as a hereditary trait. Mengele noted that individuals who have this trait also tend to have a dimple on their chin. ^ Of the Hungarians who arrived in mid-1944, 85 percent were killed immediately. ^ Based on entries in Mengele's journals and interviews with his friends, historians such as Gerald Posner and Gerald Astor believe that Mengele had a sexual relationship with Gitta Stammer. ^ Levy 2006, p. 242. ^ a b c d e Kubica 1998, p. 320. ^ a b c Astor 1985, p. 102. ^ Astor 1985, p. 12. ^ Posner & Ware 1986, pp. 4–5. ^ Posner & Ware 1986, pp. 6–7. ^ a b c d e f Kubica 1998, p. 318. ^ Posner & Ware 1986, pp. 8, 10. ^ Weindling 2002, p. 53. ^ Allison 2011, p. 52. ^ Levy 2006, p. 234 (footnote). ^ a b c Lifton 1986, p. 340. ^ Posner & Ware 1986, p. 11. ^ Posner & Ware 1986, p. 54. ^ Posner & Ware 1986, p. 16. ^ Kubica 1998, pp. 318–319. ^ a b c Kubica 1998, p. 319. ^ Posner & Ware 1986, pp. 16–18. ^ Astor 1985, p. 27. ^ Steinbacher 2005, pp. 94, 96. ^ Astor 1985, p. 80. ^ a b Allison 2011, p. 53. ^ a b c Lifton 1985. ^ Astor 1985, p. 78. ^ Piper 1998, pp. 170, 172. ^ Kubica 1998, pp. 328–329. ^ Posner & Ware 1986, p. 33. ^ Posner & Ware 1986, pp. 33–34. ^ Lifton 1986, pp. 358–359. ^ Nyiszli 2011, p. 57. ^ Kubica 1998, pp. 320–321. ^ Lagnado & Dekel 1991, p. 9. ^ Lifton 1986, p. 341. ^ Lifton 1986, pp. 376–377. ^ Posner & Ware 1986, p. 48. ^ Lifton 1985, p. 337. ^ Lifton 1986, p. 350. ^ a b Posner & Ware 1986, p. 37. ^ Lifton 1986, p. 351. ^ Lifton 1986, pp. 347, 353. ^ Lifton 1986, p. 362. ^ Lifton 1986, p. 360. ^ Mozes-Kor 1992, p. 57. ^ a b Levy 2006, p. 255. ^ Posner & Ware 1986, p. 57. ^ Steinbacher 2005, p. 128. ^ Posner & Ware 1986, p. 63. ^ Posner & Ware 1986, pp. 63, 68. ^ Posner & Ware 1986, pp. 68, 88. ^ Posner & Ware 1986, p. 87. ^ Levy 2006, p. 264–265. ^ Posner & Ware 1986, pp. 88,108. ^ Posner & Ware 1986, p. 95. ^ Posner & Ware 1986, pp. 104–105. ^ Posner & Ware 1986, pp. 107–108. ^ a b Levy 2006, p. 267. ^ Astor 1985, p. 166. ^ Posner & Ware 1986, p. 2. ^ a b Astor 1985, p. 167. ^ Posner & Ware 1986, p. 111. ^ Posner & Ware 1986, p. 112. ^ Levy 2006, pp. 269–270. ^ a b Levy 2006, p. 273. ^ Posner & Ware 1986, pp. 76, 82. ^ Levy 2006, p. 261. ^ Levy 2006, p. 271. ^ Posner & Ware 1986, p. 121. ^ Levy 2006, pp. 269–270, 272. ^ Posner & Ware 1986, p. 139. ^ Posner & Ware 1986, pp. 142–143. ^ Posner & Ware 1986, p. 162. ^ Levy 2006, pp. 279–281. ^ Levy 2006, pp. 280, 282. ^ Posner & Ware 1986, p. 168. ^ Posner & Ware 1986, pp. 166–167. ^ Posner & Ware 1986, pp. 184–186. ^ Posner & Ware 1986, pp. 184, 187–188. ^ Posner & Ware 1986, p. 223. ^ Levy 2006, p. 289. ^ Posner & Ware 1986, pp. 178–179. ^ Astor 1985, p. 224. ^ Posner & Ware 1986, pp. 242–243. ^ Posner & Ware 1986, pp. 2, 279. ^ Levy 2006, pp. 289, 291. ^ Blumenthal 1985, p. 1. ^ Zentner & Bedürftig 1991, p. 586. ^ Segev 2010, p. 167. ^ Walters 2009, p. 317. ^ Walters 2009, p. 370. ^ Levy 2006, p. 296. ^ Levy 2006, pp. 297, 301. ^ Posner & Ware 1986, pp. 306–308. ^ Posner & Ware 1986, pp. 89, 313. ^ Levy 2006, p. 302. ^ Posner & Ware 1986, pp. 315, 317. ^ Posner & Ware 1986, pp. 319–321. ^ Posner & Ware 1986, p. 322. ^ "Nazi doctor Josef Mengele's bones used in Brazil forensic medicine courses". The Guardian. Associated Press. 11 January 2017. Retrieved 12 January 2017. ^ Lifton 1986, p. 339. ^ Lifton 1986, pp. 339–340. Aderet, Ofer (22 July 2011). "Ultra-Orthodox man buys diaries of Nazi doctor Mengele for $245,000". Haaretz. Retrieved 2 February 2014. Allison, Kirk C. (2011). "Eugenics, race hygiene, and the Holocaust: Antecedents and consolidations". In Friedman, Jonathan C (ed.). Routledge History of the Holocaust. Milton Park; New York: Taylor & Francis. pp. 45–58. ISBN 978-0-415-77956-2. Astor, Gerald (1985). Last Nazi: Life and Times of Dr Joseph Mengele. New York: Donald I. Fine. ISBN 978-0-917657-46-7. Blumenthal, Ralph (22 July 1985). "Scientists Decide Brazil Skeleton Is Josef Mengele". The New York Times. Retrieved 1 February 2014. Brozan, Nadine (15 November 1982). "Out of Death, a Zest for Life". The New York Times. Hier, Marvin (2010). "Wiesenthal Center Praises Acquisition of Mengele's Diary". Simpn Wiesenthal Center. Retrieved 2 February 2014. Kubica, Helena (1998) . "The Crimes of Josef Mengele". In Gutman, Yisrael; Berenbaum, Michael (eds.). Anatomy of the Auschwitz Death Camp. Bloomington, Indiana: Indiana University Press. pp. 317–337. ISBN 978-0-253-20884-2. Lagnado, Lucette Matalon; Dekel, Sheila Cohn (1991). Children of the Flames: Dr Josef Mengele and the Untold Story of the Twins of Auschwitz. New York: William Morrow. ISBN 978-0-688-09695-3. Mozes-Kor, Eva (1992). "Mengele Twins and Human Experimentation: A Personal Account". In Annas, George J.; Grodin, Michael A. (eds.). The Nazi Doctors and the Nuremberg Code: Human Rights in Human Experimentation. New York: Oxford University Press. pp. 53–59. ISBN 978-0-19-510106-5. Nash, Nathaniel C. (11 February 1992). "Mengele an Abortionist, Argentine Files Suggest". The New York Times. Retrieved 31 August 2014. Oster, Marcy (3 February 2010). "Survivor's grandson buys Mengele diary". Jewish Telegraphic Agency. Retrieved 2 February 2014. Piper, Franciszek (1998) . "Gas Chambers and Crematoria". In Gutman, Yisrael; Berenbaum, Michael (eds.). Anatomy of the Auschwitz Death Camp. Bloomington, Indiana: Indiana University Press. pp. 157–182. ISBN 978-0-253-20884-2. Rees, Laurence (2005). Auschwitz: A New History. New York: Public Affairs. ISBN 978-1-58648-303-6. Saad, Rana (1 April 2005). "Discovery, development, and current applications of DNA identity testing". Baylor University Medical Center Proceedings. 18 (2): 130–133. PMC 1200713. PMID 16200161. Simons, Marlise (17 March 1988). "Remains of Mengele Rest Uneasily in Brazil". The New York Times. Retrieved 2 February 2014. "SS Auschwitz album". United States Holocaust Memorial Museum. 2007. Retrieved 30 January 2019. Turner, Adrian (14 June 2003). "Gregory Peck: Elder statesman of the screen who stood for nobility, honour and decency". The Independent. Retrieved 1 September 2015. Weindling, Paul (2002). "The Ethical Legacy of Nazi Medical War Crimes: Origins, Human Experiments, and International Justice". In Burley, Justine; Harris, John (eds.). A Companion to Genethics. Blackwell Companions to Philosophy. Malden, MA; Oxford: Blackwell. pp. 53–69. doi:10.1002/9780470756423.ch5. ISBN 978-0-631-20698-9. Zentner, Christian; Bedürftig, Friedemann (1991). The Encyclopedia of the Third Reich. New York: Macmillan. ISBN 978-0-02-897502-3. Harel, Isser (1975). The House on Garibaldi Street: the First Full Account of the Capture of Adolf Eichmann. New York: Viking Press. ISBN 978-0-670-38028-2. Levin, Ira (1991). The Boys from Brazil. London: Bantam. ISBN 978-0-553-29004-2. Lieberman, Herbert A. (1978). The Climate of Hell. New York: Simon and Schuster. ISBN 978-0-671-82236-1. Wharam, Philip (2015). Right to Live: an historical novel based on Mengele's life between 1945 and 1963. London: Lynfa Publishing. ISBN 9781508488996. Wikimedia Commons has media related to Josef Mengele. Belnap, David F. (10 August 1979). "Mengele Hunt Focuses on Paraguay". Los Angeles Times. Breitman, Richard (April 2001). "Historical Analysis of 20 Name Files from CIA Records". US National Archives. Office of Special Investigations, Criminal Division (October 1992). "In the Matter of Josef Mengele: A Report to the Attorney General of the United States" (PDF). United States Department of Justice. Papanayotou, Vivi (18 September 2005). "Skeletons in the Closet of German Science". Deutsche Welle. Posner, Gerald; Ware, John (18 May 1986). "How Nazi war criminal Josef Mengele cheated justice for 34 years". Chicago Tribune Magazine. Siegert, Alice (30 June 1985). "His secret out, Rolf Mengele talks about his father". Chicago Tribune Magazine.